Dustin Hopkins (born October 1, 1990) is an American football placekicker for the Washington Redskins of the National Football League (NFL). He was born in Austin, Texas but raised in Houston, Texas, where he attended Clear Lake High School. He played college football at Florida State. Hopkins was recruited by Florida State when then Seminoles special teams coordinator Jody Allen watched high school game film of Hopkins' kickoffs. Interest was also shown by Notre Dame. As a freshman in 2009, Hopkins hit 19 of 27 field goals, or approximately 70%, over the course of 2009. On November 13, 2010, against Clemson, Florida State, who was trailing the entire game, made a comeback in the 4th quarter. With less than a minute left in regulation, tied at 13, Florida State marched down into Clemson territory, where, with 3 seconds left, Hopkins made a 55-yard field goal to win the game. This was an important ACC victory for the Seminoles. In 2011, while playing against Wake Forest, Hopkins kicked his 109th point after try (PAT) in a row, breaking the previous FSU record. He would not miss a PAT until September 8, 2012, leaving him at 145 successful attempts, the sixth longest streak in NCAA history. Hopkins was drafted by the Buffalo Bills in the sixth round (177th overall) of the 2013 NFL Draft, joining punter Shawn Powell and quarterback EJ Manuel, his former teammates at Florida State. On May 10, 2013, Hopkins signed a four-year contract with the Buffalo Bills. On August 19, 2013, Hopkins was named the Buffalo Bills starting placekicker over veteran placekicker, Rian Lindell. On September 2, 2013, Hopkins was revealed to have sustained a groin injury. This prompted the Bills to sign Dan Carpenter. Due to a slow recovery from that injury and the need to further open roster spots, Hopkins was placed on the injured reserve list after Week 5. Hopkins was given a chance to earn back his roster spot during the 2014 season, but lost the competition to Carpenter; the Bills released Hopkins on August 25, 2014. Hopkins was signed to the New Orleans Saints practice squad on December 17, 2014. He was then signed to a future/reserve contract at the end of the 2014 season and competed for placekicking duties with Shayne Graham. On September 5, 2015, the Saints announced they had released Hopkins after losing the competition to Zach Hocker. Hopkins was signed by the Washington Redskins on September 14, 2015, after they had released Kai Forbath. On October 18, 2015, Hopkins kicked a career-long 54-yard field goal against the New York Jets. On November 15, 2015, Hopkins kicked a career-high 4 field goals against the New Orleans Saints. On October 30, 2016, Hopkins missed the game winner in the late stages of OT which would eventually end in a 27-27 tie against the Cincinnati Bengals. ↑ Florida State kicker Dustin Hopkins draws praise, but accuracy is off. The Miami Herald website, posted on 2009-02-10. Accessed on 2009-10-10. ↑ "Florida State Team Notes â€". Usatoday.com. Retrieved 2015-11-13. ↑ "No. 10 Florida State beats Maryland 41-14 - Yahoo Sports". Sports.yahoo.com. 2012-11-17. Retrieved 2015-11-13. ↑ "Bills sign Marquise Goodwin, Dustin Hopkins, two other draft picks | ProFootballTalk". Profootballtalk.nbcsports.com. Retrieved 2015-11-13. ↑ Chris Brown. 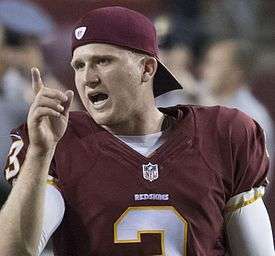 "Dustin Hopkins excited about job, grateful to Lindell". Buffalobills.com. Retrieved 2015-11-13. ↑ Chris Brown (2014-08-25). "Bills reduce roster to required 75". Buffalobills.com. Retrieved 2015-11-13. ↑ "New Orleans Saints add kicker Dustin Hopkins to practice squad". NOLA.com. Retrieved 2015-11-13. ↑ "New Orleans Saints roster tracker: Live updates as the Saints reduce their roster to 53 players". Retrieved 2015-09-05. ↑ Triplett, Mike (September 5, 2015). "New Orleans Saints cut 22 players, including Stanley Jean-Baptiste". ESPN.com. Retrieved October 2, 2015. ↑ Jones, Mike. "Redskins cut Kai Forbath, sign former Saints place kicker Dustin Hopkins". Washington Post. Retrieved 14 September 2015. ↑ "Redskins vs. Jets - Box Score - October 18, 2015 - ESPN". ESPN.com. Retrieved 2016-05-02. ↑ "Saints vs. Redskins - Box Score - November 15, 2015 - ESPN". ESPN.com. Retrieved 2016-05-02. Wikimedia Commons has media related to Dustin Hopkins.